Image Courtesy of Rachel Pernick. The Society of Les Voyageurs remains perhaps the oldest continuously operating student organization at The University of Michigan in Ann Arbor. * Founded in 1907 (“when Pine was still King”) by students Elmer “Lindy” Lehndorff and Larry Larke, the club took inspiration from the French-Canadian coureur de bois and voyageurs of the North American fur trade. Perhaps the most potent elegy to these French-Canadian roots is the solemn bon chance wished to new members upon initiation. And, twice annually, members take a ten-person “war canoe” out on the Huron River. 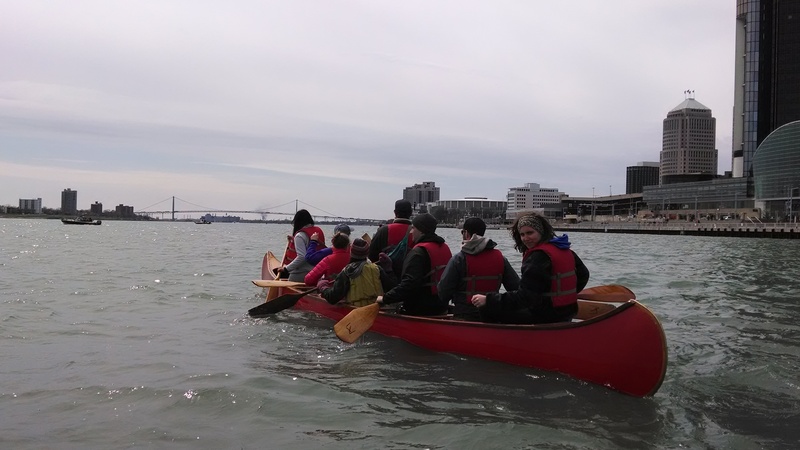 In a recent spring, we made it out to the Detroit River for a paddle. Intrepid members of the Society of les Voyageurs on an outing on the Detroit River. Photo courtesy of Rachel Pernick. *The University of Michigan Men’s Glee Club, founded in 1859, remains the oldest student organization on campus. Rachel Pernick is a student at the University of Michigan and member of the Society of Les Voyageurs.